Are neutral walls colors boring? Most designers feel that as long as you have small bursts of color and contrast with furniture and accessories, you can stay with a neutral backdrop. I don’t actually suggest brightly colored walls often…I pretty much only incorporate them if clients request it, and even then I try to steer them into painting only an accent wall. I’d rather the color in the room come from fabrics, rugs, art & accessories. 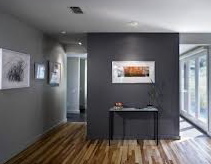 I do love dark grey, taupe or brown accent walls to add drama… still neutral, but really interesting. A dark accent wall is a great weekend project: talk about immediate gratification.